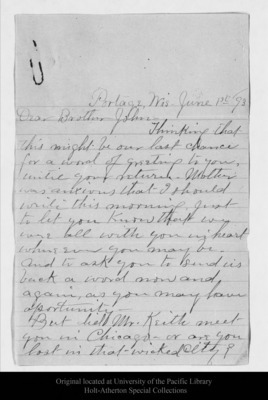 Letter from Annie L. Muir to John Muir, 1893 Jun 1. Portage, Wis. June 1st /93Dear Brother John-Thinking that this might be our last chance for a word of greeting to you, until your return. Mother was anxious that I should write this morning, just to let you know that we were all with you in heart where ever you may be. And to ask you to send us back a word now and again, as you may have oportunity – But did Mr. Keith meet you in Chicago = or are you lost in that wicked city? Original letter dimensions: 20 x 13 cm.